While some companies are achieving great savings with the cloud, many others are still on the fence. And some early “public cloud” adopters are beginning to turn back towards dedicated infrastructure. But one thing is for certain—cloud is the new IT infrastructure and computing paradigm and the impact is undeniable. 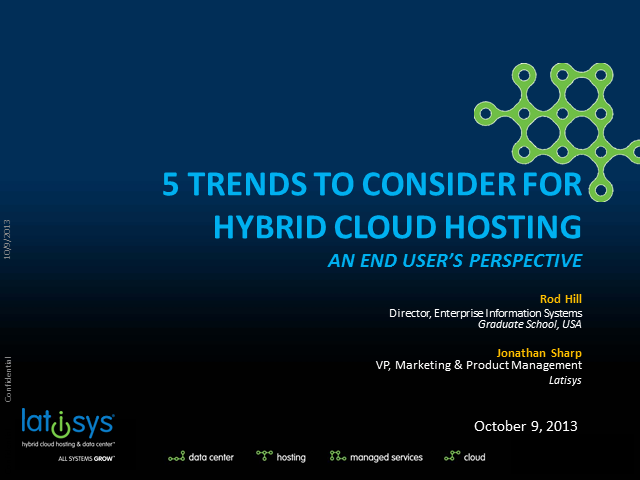 In this webinar we’ll examine the accelerating trend towards “hybrid cloud hosting”—where today’s CIOs have begun examining their workloads and opting for a hybrid mix of cloud, hosting and data center services — with workloads spread across a variety of delivery platforms but managed as a converged, federated IT infrastructure. On Premise? Outsourced? Dedicated? Cloud? Harness the Power of "Hybrid" for a True "All-of-the-Above" Approach to IT Infrastructure. With so much focus on – and hype around – the cloud, we seem to have forgotten that for most businesses IT infrastructure remains a mix of on-premise, outsourced, physical and virtual components that must be optimized into a seamless hybrid environment. Featuring IaaS experts from Latisys and HP, we'll look at how CIOs and CTOs are allocating workloads, applications and data across a diverse infrastructure today – using every tool in their arsenal in an effort to maximize legacy assets, optimize limited IT budgets and leverage technology advancements to make their business more effective and responsive. Latisys is a leading national provider of colocation, managed hosting, managed services, disaster recovery and private cloud solutions to medium-sized businesses, enterprise customers and government agencies. With a heritage serving business customers since 1994, and multiple high-density, SAS70 Type II compliant data centers across the United States, Latisys offers scalable outsourced IT infrastructure management solutions that provide customers what they need, when they need it. As a data center-centric company, Latisys is quickly becoming the hosting, colocation and cloud services company of choice for companies that demand more from their IT infrastructure partner. All while optimizing clients' return on investment. All while 'delivering more_'.